A lot of people delay writing a will for various purposes. However, what everyone must know is that writing a will must be given the right attention to ensure that your assets are distributed to the right beneficiaries and your minor dependents are designated to the right guardians in case of your death. Dying without a will can mean leaving every decision to the court. So if you have various assets and a number of children, it may be beneficial to write a will. You do not have to wait until you are ill before you do so. It can be done anytime as long as you are at the right age and with a sound mind. This article will discuss the cost involved in making a will. The typical cost of making a will depends on how you write it. DIY wills can range from $10 to $100. Hiring an attorney to draft the will for you can cost $150 to $800. 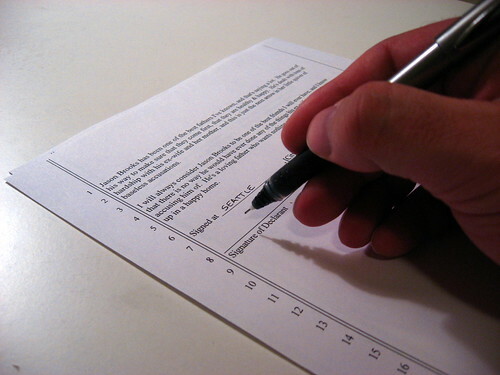 For DIY wills, the price includes a pre-made form where you simply have to fill in information on the blanks. The higher end of the spectrum can refer to will-making software. On the other hand, making a will using an attorney involves the attorney’s fees, consultation, drafting of will, and final review. Complexity of your will. The simpler your will is, the cheaper it will cost you because you can easily use pre-made forms to draft your will. However, when your assets become bigger, you may need a more complex will and so a lot of legal time and professional skills are needed to complete it. This is especially true for people who have numerous properties and complicated family situation such as a children coming from different marriages. If a simple will cost you less than $50, complex wills can go from $5,000 to $10,000. Value of your assets. The more your assets are, the higher the lawyer fees will be. This is not due to the idea of the lawyer knowing you can afford more but because it requires more tax planning. Plus, the more assets you have, the greater the liability of the lawyer gets if he happens to make a mistake. Your requests. If there is nothing unusual with your requests, the cost of hiring an attorney to draft your will is cheaper. However, if you have unusual bequests, the cost can be affected substantially. For instance, if you happen to leave everything to a caregiver or someone else outside of the immediate family and relatives, the lawyer will need a lot of time to establish your competency when you made the will because more often than not, this kind of will is usually challenged. Besides, this, the more detailed your requests are, the higher the cost can be because it requires lots of work most of the time. Rush or not? The lawyer can ask you higher fees if you want to get your will done as fast as possible. This is true because this kind of request usually involves the lawyer dropping everything else to handle your will. Your health. Your mental and physical health during the drafting of the will can greatly affect its cost. For instance, a will made when your health is really bad can have an increased chance of being challenged. This gives the lawyer more work as he needs to minimize the possibilities of the will being challenged. Your choice of lawyer. Lawyers charge differently for taking care of a will. Top lawyers in big cities usually charge more. The same is true for highly experienced lawyers. DIY wills. If you plan to do the will yourself without consulting a lawyer, the prices can be cheaper. A pre-made form for a basic will can range from $10 to $20 while will-making software can range from $20 to $100. Buying a book or kit to help you draft a DIY will can cost you extra on top of pre-made forms. Last will and testament guidebook prices usually vary. Here is a collection of last will and testament books from Amazon.com. Appointing an executor for your will can also cost you something. The executor is the person who ensures that all your wishes are carried out appropriately such as distributing your assets according to your will and do all paperwork involved in the process. Usually, the payment for the executor is 10 percent of your assets but this still varies depending on the negotiations between you and the appointed prosecutor. Know whether you need to consult a lawyer or not when making your will. Usually, you can decide on this matter by analyzing your situation. If you have a lot of assets that may involve complex issues, you may need a lawyer. Nolo.com tells you when to make a will yourself and when to call a lawyer. You can also use the information from Law.FreeAdvice.com for all the types of wills you can consider. Make sure you understand the laws of the state you are in when making a will. This is to ensure validity of the will you will be writing. Most states require people to be at least 18 years old and have a sound mind before they can write a will. However, some states can have different rules when speaking of age. For instance, Georgia’s minimum age requirement is 14. Check out your state’s laws on wills to be certain. Legal Zoom gives you an overview of the laws on wills similar to most states. The website also carries complete information of state laws on wills. If you are making your own will, make sure you follow the right steps to ensure the validity of your last will and testament. Read How to Go About Making A Will from LegalZoom.com to guide you in every step of making a legal will. Hire only efficient and experienced lawyers to help you with your will. Take note that it is best to spend more on good quality lawyers to ensure the efficiency of your will and to lift a lot of burden out of your heirs. You can use FindLaw.com’s directory of wills lawyer by state. You can also use the resources offered by the American Bar Association.